Preheat oven to 400 degrees. Toss vegetables with 1/4 cup olive oil, spread onto a baking sheet and roast 15-20 minutes. Reduce oven temperature to 375 degrees. While vegetables are roasting, bring a pot of salted water to a boil. Add the pasta shells and cook until pliable. (You don't want to overcook. You want to be able to stuff them easily, but remember, they're going to cook again.) Drain in a colander and cool with cold running tap water. Drain. Heat remaining 2 tablespoons olive oil in a large saucepan. Add onion and cook 7 to 8 minutes or until softened. Stir in garlic and cook 30 seconds. Add red wine and bring to a boil. Cook 1 to 2 minutes. Add pasta sauce and crushed tomatoes. Bring to a simmer. Cook 8-10 minutes for flavors to blend. Stir in fresh basil, parsley and crushed red pepper flakes. Adjust seasoning with salt and pepper. Stir in roasted vegetables. Set aside. Combine ricotta, 1/2 cup Mozzarella, Parmesan and egg in a bowl. Season with salt and black pepper. Spray a 13 x 9-inch baking dish with cooking spray or brush with olive oil. Spread about 1 1/2 cups of the marinara in the bottom. 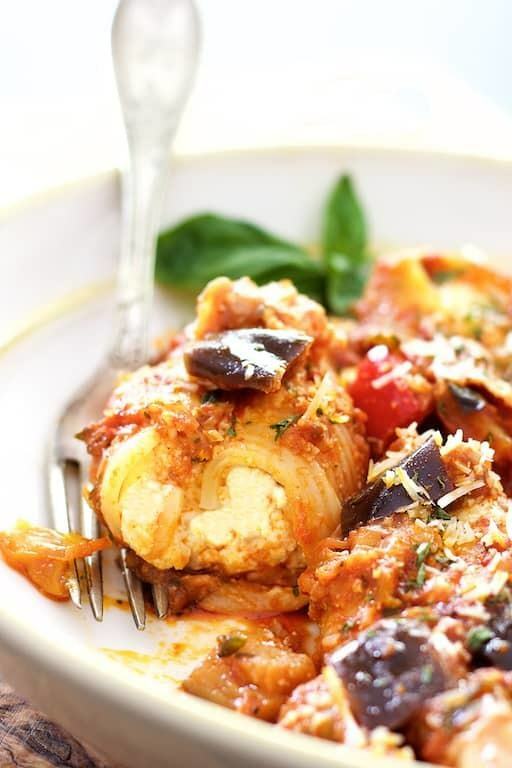 Fill each pasta shell with an even amount of the cheese filling. Place filled shells on top of the sauce. Pour remaining sauce over the top of the filled shells. Sprinkle remaining Mozzarella cheese over the top. Cover with aluminum foil and bake 35 to 40 minutes. Remove foil and continue baking another 10 minutes or until cheese has browned slightly. Let rest 5 to 10 minutes. Serve additional Parmesan cheese at the table.